New Certified Climate Smart Communities Announced! 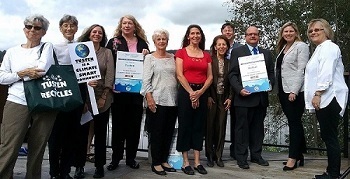 New York State's Climate Smart Communities Certification program, announced in 2014, recognizes demonstrated accomplishments in the reduction of greenhouse gas emissions and adaptation to climate change at the local level. Last week DEC announced that Tompkins County was designated as a Silver Certified Climate Smart Community for its exceptional leadership in climate action. In 2017, Tompkins County became the 12th Certified Climate Smart Community when it achieved bronze certification. Tompkins County is the fourth community in the state to reach the silver level. Check out the county's certification report for details on their accomplishments. In addition, last week DEC announced three new towns that achieved status as Bronze Certified Climate Smart Communities. Tusten was designated the state's 19th Certified Climate Smart Community, Bethel as the 20th, and Ulysses as the 21st. As part of Climate Week festivities, DEC held two press events honoring these four leading communities. 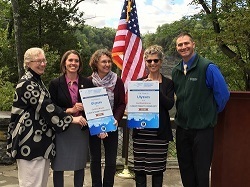 On Wednesday, at an event in Sullivan County, DEC Regional Director Kelly Turturro congratulated Bethel Town Supervisor Daniel Sturm and Tusten Town Supervisor and Energy Committee member Carol Ropke Wingert for their progress in taking action on climate change and shifting toward clean energy. For more details, click here for the press release for Bethel and Tusten. A second press event was held for Tompkins County and the town of Ulysses on Friday at Taughannock Falls State Park. 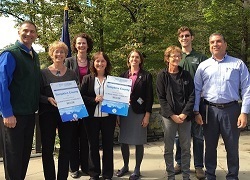 DEC Regional Director Matt Marko congratulated Martha Robertson, Chair of the Tompkins County Legislature, and Elizabeth Thomas, Supervisor of the town of Ulysses, for their achievements in reducing greenhouse gas emissions and planning for a sustainable, low-carbon future. For more details, click here for the press release for Tompkins County and Ulysses.